When it comes to interior design, innovation is key. Today we’re taking a look at ten of the world’s best offices, both in terms of luxury and innovation. Read on to find out who made the cut! Designed by Bestor Architecture and executed with the help of Loescher + Meachem, this modern office covers over 100,000 square feet, shared between two Los Angeles-area structures. They opted not to lean into the frivolity that’s become the hallmark of Silicon Valley workplaces, and instead built a sleek, sophisticated space, to reflect their crafty, international approach to business. Most of the aesthetic is characterised by white and brass, and more colourful palettes are reserved for smaller offices. The colours featured in co-working spaces are meant to indicate their use – blue is a peaceful room, where staff can expect quiet, stress-free concentration. Red is for high-energy co-working, and so on. Coca-Cola has offices all over the world, but their London space is worth calling out. Housed in a restored building from the 1920s, the interior is sentimental, yet modern – it includes open-plan offices, hot desks, and a café. The lobby also features a 21-foot-tall comet sculpture built by Lancashire-born artist and designer, Stuart Haygarth. Created by Jensen Architects, the Kirshenbaum Bond & Partners West office in San Fran is an interesting study in bizarre design. The advertising agency’s workplace is made up of strangely-shaped rooms, chalkboard walls, slanted ceilings, and tiny stairways leading into elevated booths for phone calls. The entire office is housed in a giant warehouse, making navigating between rooms feel like wandering the streets of a small, surreal town. Social media giant, Facebook, famously used its own software to help design their Palo Alto campus. Via Facebook poll data, they were able to crowdsource exactly what their employees wanted. It’s no wonder they wound up with a strange variety of rooms to blow off steam in – from dedicated DJ areas to miniature skate parks! The Google Zurich office includes a very specific and unusual rule – no staff member is to be more than 100 meters away from food. In order to make the rule work, the Zurich office features kitchens just about everywhere, not to mention the huge cafeteria, which feeds the staff three times a day. The office features everything you’d expect a Google office to offer. Got to get down a level fast? Take the fireman’s pole or the slide. Need some peace and quiet? Try the aquarium! Thai mobile phone company DTAC broke a few records with this one. 22 floors, six buildings, and 650,000 square feet equal the biggest office lease in Thai history. The office campus dedicated an entire floor to relaxation, which might seem excessive until you remember they have twenty-one more floors. DTAC has indoor soccer, a concert hall, an indoor running track, and a number of rooms designed for informal meetings, such as the dining hall, or conversation pit. To top it off, the office features an open rooftop terrace with stunning views of the Bangkok skyline. Dreamhost has the ideal spatial design – both open-plan and private workspaces are distributed through the space, offset with places to eat and play, of course. One of the central designs tenants was to move away from fluorescent lighting whenever possible, so a large set of huge windows fill the place with natural light. To avoid the place looking too harsh, Dreamhost has also used colour to give the space a light, breezy feeling. 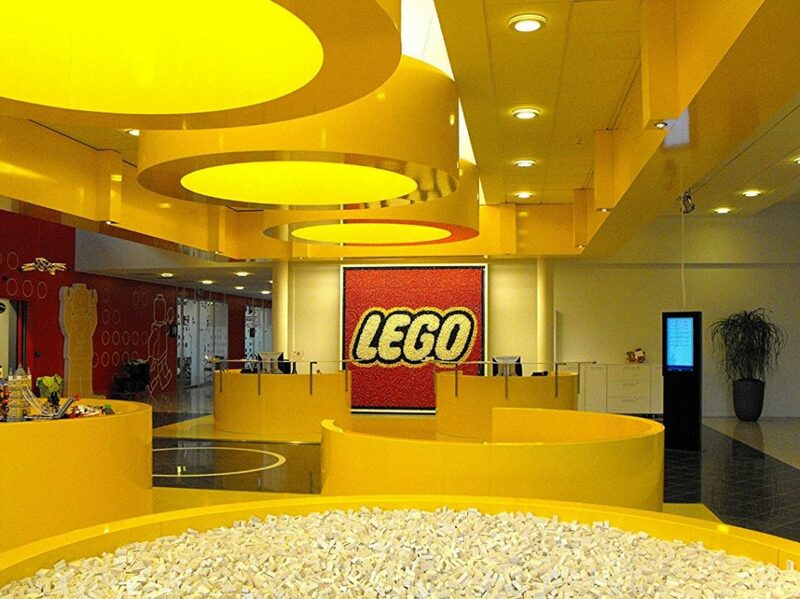 We bet you can guess what’s in plentiful supply at the Lego office in Denmark! The entire office is built from the ground up to accommodate imagination, including Lego just about everywhere, so staff can play with it while they work. A massive project which brought together the staff of 11 previous offices under one roof, the Corus office in Toronto clocks in at a huge 500,000 square feet and has been called Toronto’s smartest building. You name it, and they probably have it. Slides? Check. A five-story atrium? Check. Boardrooms shaped like ice-hockey rinks? It’s Toronto after all, so check! Finally, we have Red Bull in Amsterdam. Planned by Sid Lee Architecture, the Red Bull office lives inside a former industrial shipbuilding factory, right by the north harbour. With a café called The Dive and a hangout space called The Crash Room, you can imagine how luxurious the space is. Beyond the energy drink they are most known for, Red Bull is extensively involved in the electronic music scene, running programs such as the Red Bull Music Academy. It’s no surprise then, that their Amsterdam office features a fully operational recording studio. Time for an office design upgrade? We don’t all have a few hundred thousand square feet lying around to build an office like these, but the concepts can be applied anywhere. If you think it’s time to do away with old, uninspiring cubicles, and look into agile office design, contact the expert team at DB Interiors today, so we can book in your free discovery call!